1) Out of Africa Wildlife Park - Right now that the weather's been nice (but alas, May is coming, the month where temperatures elevate steadily into the 90s before swooping to the 100s as the transition into June comes), I've been going to Out of Africa a little more often. It's nice to just walk around the park, see how Sycamore (their year old grizzly) is doing, say hi to the emus, or to get the chance to see how the different tigers play during Tiger Splash. Usually I've been seeing Chalet (the white tiger), but this last time they had Zion; their personalities are so different. 2) Tarte Amazonian Clay Volumizing Brow Powder in Rich Brown and Frame Worker Double-Ended Bamboo Brow Powder Brush - Why had I been using a brow pencil instead of a powder? I had always thought that brow powder would be like putting eyeshadow in my brows, but it's actually a thicker powder that sticks in better and really fills in the empty space. It also really helps me give shape to my brows, like that nice little angle in the middle that I had never really been able to get just from tweezing. This powder and brush are just amazing. 3) YouTube Channel: Justkissmyfrog - I stumbled across Leena's channel and instantly liked her approach. She talks about a variety of subjects: books, makeup, the meaning of beauty and self-image, questions about feminism, publishing, etc. But whatever she talks about, she really gets into it and goes into detail. I don't watch many booktubers, for instance, because even if you find someone with similar reading taste to yours, I get tired of just watching book summaries and comments about whether or not it was good/likeable. Leena goes into detail about what a book does or tries to do, whether or not it succeeds, what is of value about it, and what the context about it all is. She works in publishing now, so there is also some interesting material about that--and some perspectives on the look of books that I hadn't so much considered before. In about two months, I've made my way through all of her old videos up to the new ones--and it's been quite a journey. 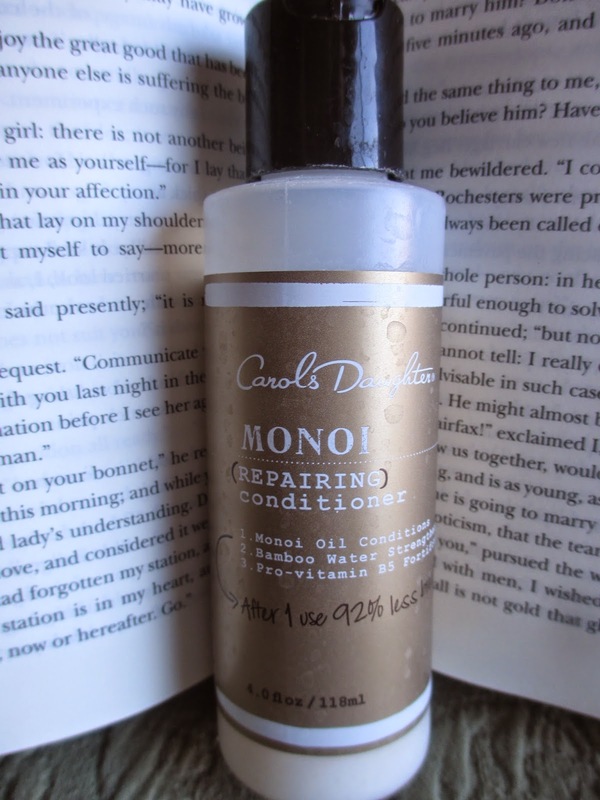 4) Carol's Daughter Monoi Repairing Conditioner - My friend had two of these from one of those promos that Ulta does, so she gave me one. Now, I never felt like my hair needed repairing, but after I use this conditioner, my hair feels so much fuller and richer that I'll be tempted to buy more after this bottle is gone. It doesn't need to be an everyday conditioner, just something that you use occasionally when you want your hair to be nice. It makes me wonder why I've never used shampoo from Carol's Daughter (besides the fact that it's kind of pricey). 5) Josh Groban's Stages - Not sure whether or not I'll do an individual post on this. Probably. For now I'll just say that I needed this album from Josh: Illuminations and All That Echoes were too pop for my tastes and I was really wishing for something a little more leaning back toward classical (Closer is still my favorite album of his). Stages is full of songs from musicals--and it'll remind you that Josh can sing if you needed a reminder, and if you didn't, it'll just be a good album for listening. 6) Free People Headband - I've kind of been going through a weird stage right now where I'm not sure who I am, who I want to be, or who I should be. One of the results of this is that I hardly ever feel like leaving my hair down, and I've been doing a lot of ponytails, which I used to never do unless I was doing something outdoorsy or I hadn't washed my hair. Now for some reason I'm enjoying ponytails. So I'm also liking headbands. I got this purple and white one at Free People; it kind of reminds me of Star Wars for some reason. 7) Fireflight's Innova - Also a new album, this one doesn't come out officially until Tuesday, but I already have it since I pre-ordered; I also might do another post once I've listened to it more. So far, there are a few songs on here that I really like, and I always look forward to more Fireflight music, so I'm happy. 8) Lip Gloss - Along with the ponytails, I've been going for lip gloss instead of the crayon-like lip stains (mostly from Tarte). This is very weird of me because I don't like lip gloss much: I prefer a little color without all that shine. But maybe it makes sense: when I have my hair down (I have a lot of hair), it tends to get stuck on lip gloss if I'm wearing any, so if I have my hair out of my face, I can wear lip gloss more practically. I know that isn't the reason . . . but I don't really have a reason. I don't know: my little Tarte glosses from Christmas sets are happy to be getting used, though. 9) Dram Posy Tea - This tea's from Santa Fe and it's the perfect thing for a quiet evening or afternoon. It's full of "wild and organic" flowers: rose, calendula, chamomile, lavender, nettles, hibiscus. 10) Orange/Pink Eyeshadow - Actually, it's kind of pink eyeshadow that I've been interested in lately, but the best I have in my collection is a pinky orange, so I've had to settle for that. Either way, both colors just feel right for this time of year when the flowers are out, the weather's getting warm, and shorts and dresses are the norm.